This is a mod many will like. It allows you to move around the UI to better suit your needs. I needed this as the placement of the raid frames is just bad. Set a minimum level of transparency for your attributes or have them show always. Display a 'range to target' indicator by the reticle. This looks awesome. I've been wanting something like this. Can't wait to DL and try it. Nice stuff, i think i want this one! Hopefully it works with the multi-quest tracker one as well. Is that the ZrMiniMap you're using? This is an awesome addon! Tried it today and it's my favorite addon so far. Amazing how much simply repositioning UI elements can improve your experience. Yeah I turned off wykkids and ftcs frames to use this instead. being able to move the frames wherever I want makes more of difference to me, on top of the fact that the frames all still autohide when out of combat and your resources are full. That's one thing that drove me nuts about the ftc frame was that it was always on. I really like the minimal look of this game. 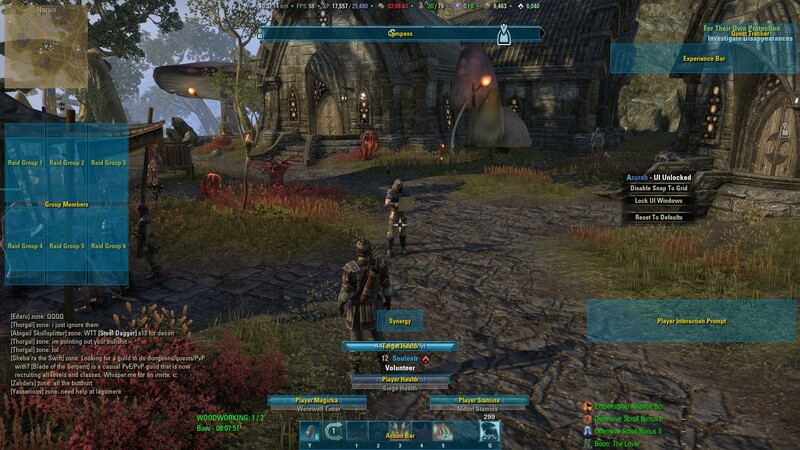 Its a fresh change to mmos. With this I get a more detail but only when I need it. On top of having it exactly where I want it. Now if they add a little customization for frame graphics this will be the first real frame replacing mod worth getting. Great find thanks for the post. Dont forget that he dose some nice updates. Waiting for new feature Player only buff list and 'proc' tracking. It nice to see so i do not spam my abilities with debuffs on them.